Nauplion has known many foreign hosts. It was taken over by the Byzantine in the middle ages and held into their hands until it was passed on to the French as a fief from the duke of Athens to the Enghien family in 1247. It remained in the Enghien family until 1388 when the Venetian husband of one of the Heiresses transferred his rights to the city over to Venice. The Venetians held the city for the next two hundred and some years. The Venetians fortified the city, including Boúrzi island in the center of the bay. Furthermore, this occupation had a distinct impact on the architecture of the town. 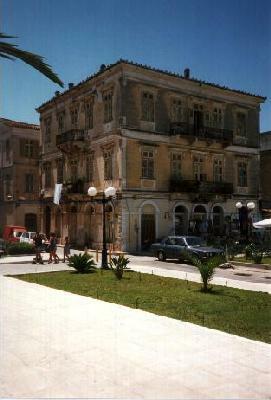 Most of the buildings on the water front and the old part of town resemble Venetian style houses. 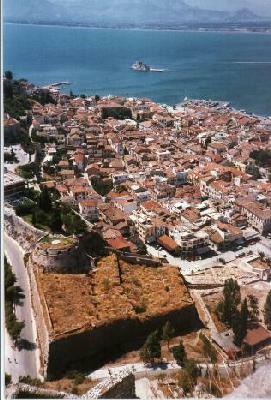 In 1540 the Turks reached Nauplion and after a long struggle the mighty town fell. However the Turks neglected the cities defenses and it was re-taken by the Venetians in in 1683. Upon re-taking the castle, the Venetians built a mighty castle atop a two hundred and some meter hill on the waterfront. This castle had eight independent bastions that were linked by hidden passages and walk ways. Each one could function on its own if its neighbors were captured. This new occupation from the Venetians came with an influx of people as well as new urban and economical development for the city. The second Venetians held out until 1715 when an army of a hundred thousand Turks invaded the city, pillaging the town and massacring the people after a long siege that had cost the invading army eight thousand lives. The town was then held in Turkish hands until the Greek war of independence. After three failed attacks on the city Greek forces were finally able to capture the fort and liberate the city from the Turkish army. 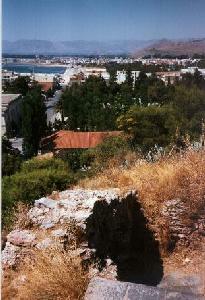 The city then became the first capital of Modern Greece. Because of this fact fierce battles were fought off of its shores during the war of independence, and then political battles were fought here until the capital was moved to Athens in 1834. Nauplion will not let people forget it was the first capital though, when you drive in to the town, you see signs reminding you of that fact. The city is perfectly located jutting into the Argolic Gulf. The three main features of the town are the Castle, the Houses and the Harbor. There is a very nice walk you can do around the sea shore and harbor to see the beauty of the area. Or you can climb the 999 stairs to the castle and see the harbor that way. 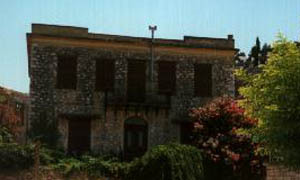 The town is also known for the old prison in the center of the Harbor. Because of this I split the gallery into two parts. 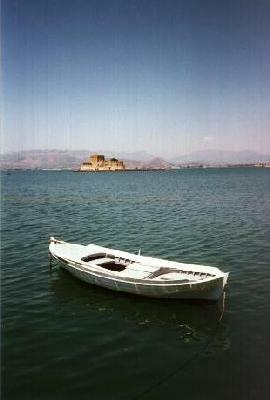 The first is of the Castle, The Palamídi, and the harbor. I hope you enjoy the photos. Any comments, please E-mail me, <. Click on the title or thumbnail to view the larger picture. This is a fortified island in the middle of the harbor. It served as the defenses for the harbor during the Venetian rule and latter as a prison. 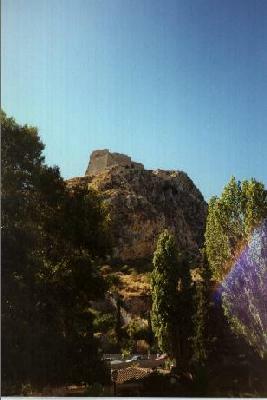 The Palamídi is the castle built by the Venetians during their second occupation. It stands two hundred and sixteen feet above sea level and you have to 999 steps to reach the top. But it is well worth the view. A view from the fort looking at the town and harbor.